Thank you to all the members that participated in the BCSE 2018 Membership Meeting. Thank you also to our hosts, the American Gas Association, and our meeting sponsors, Capital Power and the Corn Refiners Association. The Clean Energy Business Network (CEBN) is a division of the BCSE working to grow the clean energy economy through policy, public education, and business development assistance for energy companies. The CEBN’s 3,000+ members span all 50 U.S. states and several international countries and a diverse range of technologies. In October 2018, the CEBN launched new tools such as a searchable business directory and funding database to promote collaboration among small businesses, corporations, investors, consultants, and others working across the clean energy landscape. Learn more in this 1-minute video, and use promo code CleanEnergy25 for $25 off premium corporate memberships (starting at $250/year) now through 12/10. With the continued hurricanes and wildfires this fall, the importance of resilience planning and investment has never been more urgent. As such, the Council is pleased to join a new partnership with Qualcomm, Smart Cities Council, Texas A&M and NASEO to help communities in Texas and Puerto Rico that were impacted by the 2017 hurricanes with resilience planning. The Council’s role is to share private sector views on resilience planning best practices as well as connect companies and industry associations active in these localities with government officials and key decision-makers on the ground as investment decisions are made about rebuilding and resilience upgrades. The project is being sponsored by Qualcomm Incorporated and will include discovery workshops and conferences over the next eight months. The project is kicking-off with a Readiness for Resilience conference in Puerto Rico December 4 and 5, in coordination with Puerto Rico Governor Ricardo Rosselló‘s office. In addition, Discovery Workshops will be held December 11 through the 13 in three impacted regions in Texas. As Congress returns post-election for a lame duck session, the Federal Policy Committee is focused on extending remaining clean energy tax measures, appropriations for Department of State and Environmental Protection Agency, and calling for a strong energy title with mandatory funding for rural energy programs in the Farm Bill. At the same time, BCSE is preparing to hit the ground running at the start of the 116th Congress with outreach on a new budget agreement, FY 2020 appropriations, infrastructure proposals and educating new and returning members of Congress. With the prospect for a tax package still in the works for the end-of-year continuing resolution and omnibus bill, BCSE has been reaching out to Senate Finance Committee members to ask them to approach their committee leadership to ensure that clean energy measures are part of that package. BCSE outreach to House Ways and Means Committee members will continue to diminish any issues on the House side. See here for BCSE’s October letter on tax extenders. The Council is outlining its legislative recommendations for the 116th Congress in a policy document framed around advancing clean, resilient infrastructure. Education will be one of first priorities with many new members of Congress coming to Washington and significant changes to key committees, including the House Energy and Commerce Committee, House Ways and Means Committee, and the Senate Finance Committee among others. The Federal Policy Committee is planning for a fast pace of Hill meetings and briefings to bring Members of Congress and their staff up to speed on our issues. The FY 2019 Energy and Water Appropriations bill signed into law in September represents a strong bipartisan endorsement of the Department of Energy’s work on clean energy, with most clean energy programs receiving funding equal to current-year levels, and many receiving an increase. There are still some technologies, such as waste to energy, that haven’t received adequate research dollars, however, so BCSE will focus some of our work in those areas in the next Congress. In addition, BCSE will also will work to ensure the FY 2019 funds are spent as intended by Congress and will work to maintain the momentum for FY 2020 in the face of significant budget challenges. FY2019 funding for the Environmental Protections Agency and the international climate finance programs at the State Department have yet to be enacted and will be included in the end-of-year omnibus bill. BCSE has met with staff of the House Transportation and Infrastructure Committee to convey some priorities for the staff to share with the Federal Emergency Management Agency (FEMA) as they implement the new Disaster Recovery and Reform law (DRRA) and has joined a coalition of advocates in submitting extensive comments on building energy codes that should be considered. The DRRA includes provisions to address rising costs of disasters and help communities better prepare for hurricanes, floods, earthquakes, wildfires and other disasters, with 6 percent of certain spending under the FEMA's Disaster Relief Fund to go to a pre-disaster mitigation fund. For every $1 the government spends on mitigation, it saves $6, according to research from the National Institute of Building Sciences. At the NARUC Annual Meeting in Orlando, Florida, on November 11, utility commissioners and their staff, federal officials and clean energy industry stakeholders enjoyed a clean energy industry reception, complete with a live guitarist, at Jimmy Buffet’s Margaritaville Restaurant. Utility commissioners are key state policy makers tasked with economic policy and energy planning decisions and BCSE-sponsored events at meetings such as the one in Orlando provide unique opportunities to reach these important state regulators. 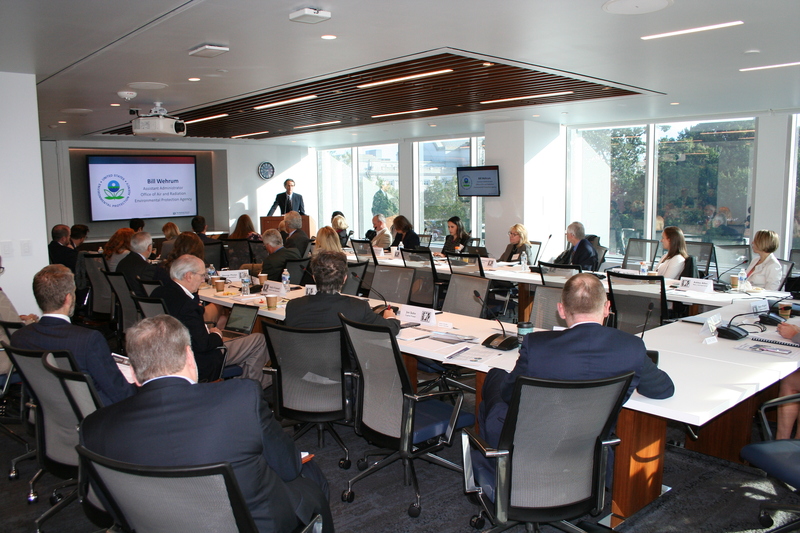 BCSE engages with utility commissioners at these meetings to highlight market rules, practices, and policies that should be addressed in order to expand the use of a wide range of clean energy technologies. BCSE engagement enhances member access through activities that provide one-on-one access to commissioners and commission staff from across the country. 2019 Annual meeting November 17-20 in San Antonio, Texas. With the recent release of the Inter-governmental Panel on Climate Change (IPCC)’s Special Report on Global Warming of 1.5 ̊C, the first-ever gathering of sub-national actors at the Global Climate Action Summit (GCAS) in September, and the upcoming UN Climate Change Conference (COP 24) in Katowice, Poland, the pressure is on for national governments to finalize a clear and transparent rulebook for the Paris Agreement and turn its attention to implementation. BCSE members, as solution providers, are not only making their own commitments to act on climate change, but are working with cities, states and other governments to advance policies and investment frameworks that will accelerate deployment of clean energy solutions. See how Council members participated in GCAS in San Francisco, CA. The BCSE will lead a delegation of members to COP 24 and host a side event on December 8, Powering Ambition: Energy & Technology Solutions To Build Low-Carbon Economies, at 11:30 CET, in partnership with the Alliance to Save Energy, Corn Refiners Association and U.S. Green Building Council, and will also host events at the U.S. Climate Action Center, which will be hosted by the We Are Still In coalition from December 7 – 10. Watch for additional details to be released on the BCSE website. Working with a videographer can seem expensive, but plan ahead to realize the breath of deliverables that can come from one video, including technology testimonials, community engagement, anecdotes for written content such as blog posts, speeches, op-eds and b-roll footage. If you choose to do-it-yourself with your cell phone camera, understand that this works best for close-up shots, and it is best if you hold your phone horizontally. Use an external microphone and tripod to keep the phone steady. Include captions with your short video or GIF on social media; most people don’t turn on the audio when scrolling through their news feeds. Thirty six states held gubernatorial elections in November, and many states across the country are considering significant energy proposals such as raising energy efficiency and renewable energy standards, joining emissions trading schemes, and building out sustainable transportation infrastructure. Many governors-elect ran on platforms that included clean energy and climate change preparedness. This makes clean energy education and advocacy at the state level especially important. In partnership with the CEBN, BCSE conducted outreach to gubernatorial candidates to share one-page factsheets on their states’ energy mix. This outreach will continue as newly elected governors begin their administrations. Over the fall, BCSE has also engaged with policymakers in a few select states. In Virginia, meetings with the Department of Environmental Quality and the Department of Mines, Minerals and Energy centered around the writing and publication of the Virginia Energy Plan, and the continuing effort to finalize a regulation that would enable the state to link with the Regional Greenhouse Gas Initiative. The Energy Plan was published in October, and the RGGI linking regulation was revised, with the final regulation expected to be released in early 2019. Pennsylvania also continues to support clean energy by advancing initiatives for electric vehicles, meeting solar power goals, and more. BCSE’s meetings this fall with the Office of Governor Tom Wolf and the PA Department of Environmental Protection focused on these programs and how BCSE members can continue to provide assistance and solutions on the ground. BCSE will continue to monitor state action on clean energy and will seek member input on how best to engage at the state level.